Master NAKAMURA has created his own school, the Takeda Ryu Nakamura ha, in line with the ancient Samurai fighting arts. Takeda ryu was founded by Hisashi NAKAMURA. This school includes several Japanese martial arts such as kenjutsu, Jojutsu, Iaijutsu, Aikijutsu, Shurikenjutsu, etc. This technique was passed down to the family of Shingen TAKEDA. Hisashi NAKAMURA was born in Nagano in 1932. In 1948, he started learning Takeda ryu Aikijutsu in Fukuoka with Master OOBA, 43rd successor of Takeda Ryu. At the death of the latter, master NAKAMURA succeeds him as Soke. Convinced of the benefits of free sparring and competitions, Soke Nakamura emphasizes the realism of techniques in his teaching style. In 1978, NAKAMURA decided to create his own school, the Takeda ryu Nakamura ha. 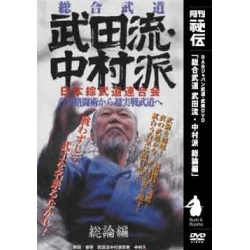 This DVD is the second volume in the series of "Takeda ryu Nakamura ha"